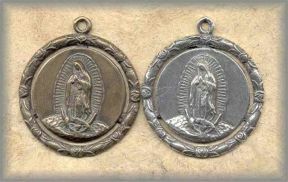 ||||| OUR LADY OF GUADALUPE: Our Lady Of Guadalupe is one of the most popular of all the medals we sell. She is known as OUR LADY OF THE AMERICAS and OUR LADY OF THE PREBORN. ||||| GIVING NEW LIFE TO OLD TREASURES: A beautiful reminder for those who are pro-life because in this image she is pregnant with her tiny baby, Jesus. Her apparition on the cloak of St Juan Diego in 1531 brought a major conversion to the people of the anicent Aztec nation. The cloak or 'tilma' of Juan Diego may still be seen in the Basilica in Mexico City, which is a miracle in itself as the cactus cloth has a normal life span of 20 years. ||||| CHECK SAMSARA TOO: If you dont see a medal of Guadalupe here that works for you, go to the ADVANCED SEARCH at the top of this page (upper right) and put in Guadalupe and many more will come up. ||||| MAKING A DIFFERENCE: What makes us very happy is to hear how these pieces are making such a difference in the rosaries people are making - that they actually sell the piece.